It’s been quite a while since we’ve had a wireless mouse in for review at Castle Shotgun, and for that I apologise. To rectify the situation, I’ve got Razer’s Mamba + Firefly Hyperflux combo in today, which is absolutely 100% the name of a mouse and mouse mat and definitely not a binned subtitle for Kingdom Hearts 3. The main attraction here is Razer’s aforementioned Hyperflux tech, which keeps the Mamba charged at all times simply by virtue of keeping it on its Firefly mouse mat. No need for charging, no running out of power mid-stab, nothing. What’s more, because the Mamba doesn’t have or need any kind of internal battery, it’s considerably lighter than your average wireless mouse, weighing just 96g. There’s just one, rather hefty problem. The price. At time of writing, the Mamba + Firefly bundle goes for a princely sum of £250 / $275. That’s a lot to spend on a mouse and mouse mat, even if it wireless. I mean, you’ve still got a wire going out of the Firefly into your PC, so it’s not like you’re not getting rid of them completely, but man alive, £250! I could buy a semi-decent graphics card with that money and still (maybe) have a bit left over. Can a mouse possibly be worth that much? The Mamba does, at least, look a lot less heinous than the similarly wireless and magically-non-charging Logitech G903. There’s still a fair amount of RGB lighting going on down the central spine of the mouse, starting at its scroll wheel and finishing at its rear logo and tiny power indicator, but almost all of that gets covered by your hand, keeping any distracting flashes to a minimum. The Firefly is also one of the subtler RGB mouse mats I’ve seen recently. I barely even noticed its LED ring half the time, even when its brightness was set to 100%. This may come as a disappointment to some RGB fanatics, of course, but at least it won’t draw your attention away from whatever you’re playing. I also prefer the overall shape and style of the Mamba as well. It doesn’t look like dozens of pointy cybernetic elbows fused together, for a start, and its smooth, sculpted frame is absolutely perfect for my lazy, minimum effort palm grip as well. The Mamba’s rubbery sides also provide plenty of anchorage for your thumb and little finger when moving it across the mat, and its two chunky side buttons are always within reach. These buttons can be customised to perform almost any function you like, too – along with its main right / left clicks and the scroll wheel’s side-to-side tilt actions. You’ll have to download Razer’s Synapse software to do it, but you’ll find everything from keyboard and macro bindings, media keys and activating Windows shortcuts here to lighting and profile switching, program launching and even pasting in specific lines of text. You can also use them to change the Mamba’s DPI or sensitivity settings. You’ve technically got two buttons below the scroll wheel that do this already, but having them on the side is infinitely more convenient if you need to adjust them in-game. There are five customisable presets to choose from ranging from a dead-slow 100 DPI all the way up to a generous but far-too-fast 16,000 DPI, but arguably the most useful option of the lot is Razer’s so-called ‘Sensitivity Clutch’. Just like the Razer Naga Trinity, this lets you switch to a DPI speed of your choosing for as long as you hold the button down – handy, say, if you need a steady hand trailing someone down a sniper’s sights for a couple of seconds before getting back to the business of frantically dashing for cover and not having your virtual head explode into a mountain of jam. There’s even the option to have a separate DPI clutch for when you’re moving the mouse vertically as opposed to horizontally, giving you even more flexibility to help justify the Mamba Firefly’s eye-watering price. Unfortunately, this feature isn’t unique to the Mamba, as the aptly-named Fnatic Clutch 2 and Fnatic Flick 2 do this as well for about a fifth of the cost, making the Mamba feel less special as a result. Of course, a big part of why the Mamba’s so expensive is its accompanying Firefly mouse mat. Aside from the aforementioned RGB ring (which always adds a significant chunk of change onto anything because RAINBOWS) and that clever Hyperflux stuff that keeps the Mamba charged at all times, the Firefly also comes with a reversible hard and cloth-style surface. This sits inside a small recess in the incredibly firm and grippy main base, and never once felt like it was about to come loose or ruck up round the corners. Personally, I liked using the harder surface on the Firefly, as the increased friction produced by the cloth one made my mouse movements feel quite slow and sluggish by comparison. A lot of it will come down to personal preference, of course, but at least you’re given the option here rather than having to settle for one or the other – which is again something that goes some way in justifying its wallet-murdering price. The problem is that Logitech G903’s Powerplay mat does pretty much the same thing as the Firefly in terms of its magic no-need-to-charge-it gubbins, and comes with the same hard and soft surface options. What’s more, despite costing £100 / $100 on its own, at least here you have the option of pairing it with a slightly less expensive compatible PowerPlay mouse, such as the Logitech G603 or G703. Together, you can shave around £100 / $100 off the price of the Razer Mamba + Firefly Hyperflux and still get pretty much exactly the same deal. As a result, as nice and flexible as the Mamba Firefly combo is, I just can’t see myself, or indeed anyone, dropping £250 / $270 on it. It doesn’t look like £250 / $270’s worth of kit, and I don’t feel there’s anything particularly special about it to justify spending that amount of money on it. The £50 / $60 Fnatic Flick and Clutch 2 offer most of the same button customisation options and, as I’ve just discussed, Logitech offer pretty much an identical kind of wireless tech for a heck of a lot less. 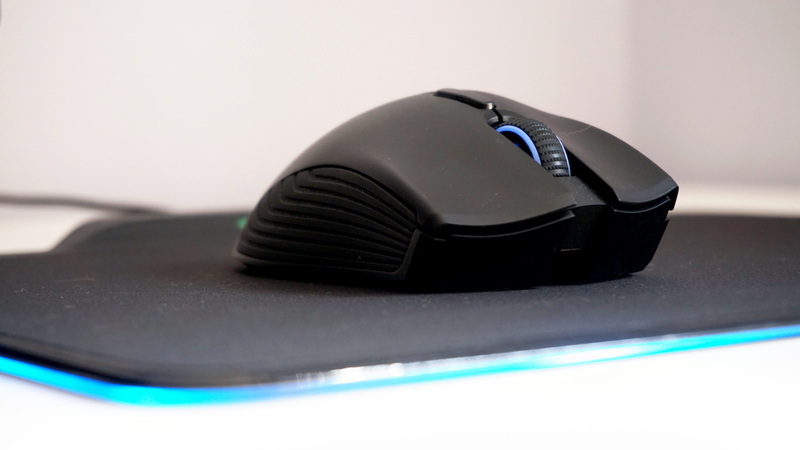 Even if you do go down the Logitech route, though, you’re still spending £150 / $150-odd on a mouse and mouse mat – which is just a bit mad in my books. What’s more, you’ve still got a wire to contend with and keep tidy, which – let’s face it – isn’t really any more convenient of having a wired mouse. Even Razer themselves make a big song and dance about how the Mamba is as light as a traditional wired mouse, which just begs the question why you wouldn’t just get one of those in the first place and save yourself a load of cash at the same time. There may well come a time when a wireless mouse manages to convince me to take the plunge and get the best gaming mouse money can buy, but not today.